Can Ctrip.com International, Ltd. (ADR) Keep the Momentum Going? The Chinese travel services provider has several interesting angles to watch. Ctrip's English language homepage. Image: Ctrip.com. 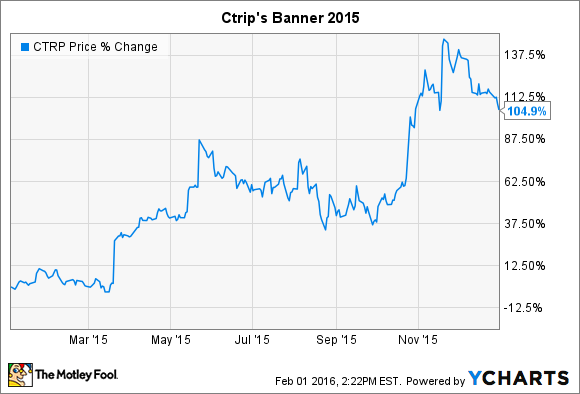 Last year was a banner one for shareholders of Ctrip.com (NASDAQ:CTRP). Company CEO James Liang prepared shareholders for a sustained period of unprofitability as competition among China's online travel agencies (OTAs) heated up, creating a "race to the bottom" in terms of discounting. But what investors got in 2015 was a flurry of deals that consolidated the industry. In May, Ctrip purchased a 37.6% interest in competitor eLong (UNKNOWN:LONG.DL). And in October, Ctrip executed a share exchange with Chinese search giant Baidu and its subsidiary -- and Ctrip OTA rival -- Qunar (NASDAQ:QUNR). The deal means that Baidu now has a 25% voting interest in Ctrip, while Ctrip controls 45% of the voting power in Qunar. The result of the deals, and Ctrip's continued execution of its long-term goals, was the doubling of Ctrip's stock in 2015. With an eye on the long-term prospects for the company, here are three things I'll be watching closely when Ctrip next reports earnings. The date of that Q4 report has not yet been announced. Ctrip has shown impressive growth in both its accommodation (mostly hotels) and transportation (mostly airfare, but increasingly buses and trains as well) bookings. While revenue hasn't grown quite as fast as the volume of bookings has, both metrics remain very impressive. Management expects revenue to grow between 45% and 50% for the fourth quarter. In the company's last conference call, CFO Cindy Wang broke those numbers down even further, stating, "both hotel and transportation revenues were increased about 40% to 50%," according to a transcript from Capital IQ. She further said that packaged tours -- a division which represented 19% of revenue last quarter -- was expected to grow, "at about 50% to 60%." Ctrip has spent the better part of the last two years building out the infrastructure it deemed necessary to be China's leading OTA. That included the manpower and technology to open up both train and bus tickets for purchase on the company's platform. It also meant spending millions on Ctrip's mobile app (more on that below). Those increases in spending far outpaced jumps in revenue from 2012 through 2014. But as you can see, during the first nine months of 2015, the trends finally started working in investors' favor as the company was able to ease off on spending somewhat while reaping the rewards for its prior investments. Last quarter represented the first time in over three years that revenue grew faster than combined operating expenses. Even though I think investments in the future represent money wisely spent, I think the market could react very favorably if recent trends of revenue growing faster than expenses continue. I've noted a number of times before that I believe Ctirp's mobile app is one of the most important differentiators it has. With a goal of creating a one-stop-shop for all things travel in China, users can book air, hotel, bus, and train reservations all from their mobile phones. They also have access to ancillary services, like help in processing visa and passport applications. Between September 2014 and July 2015, the number of devices that had downloaded the app jumped from 350 million to over 1 billion. I was somewhat disappointed that management failed to address the app in the last earnings release and conference call, and will be hoping for an update this quarter. The second point I hope for more color on is how the investments in both eLong and Qunar could affect that company moving forward. Obviously, the "race to the bottom" should be ending soon, meaning more profitability for Ctrip. But these may simply be the first steps in fully assembling all of these OTAs under one umbrella in China. I'll be looking for any hints of where the relationships between these three could be headed. Against the backdrop of a Chinese stock market that is failing, and reports of a significantly slowing economy in the Middle Kingdom, it will be interesting to see if Ctirp's stock can continue to buck the trend.